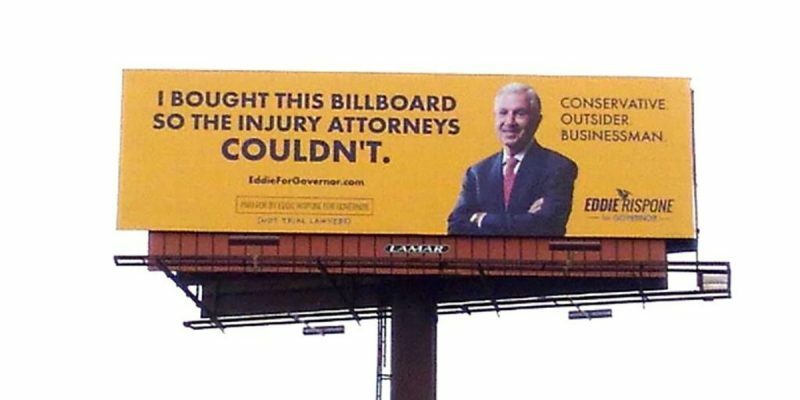 Our readers already know about the billboard Eddie Rispone put up today on I-10 coming into Baton Rouge from the west side of the Mississippi River which proclaims that he bought the billboard so injury lawyers couldn’t. That billboard was something of a hit on social media before it even went up, as it’s been shared around quite a bit in the last week – now that it’s live it’s likely to do wonders to boost Rispone’s name ID as a gubernatorial candidate given the amount of traffic snarled on the interstate in West Baton Rouge Parish waiting to travel over the bridge. But billboards aren’t just an opportunity for Rispone’s gubernatorial campaign to get attention this year. They’re a good deal more than that. Especially considering a pair of bills, HCR 4 and SB 211, which have taken aim at the ubiquitous billboards on the state’s highways which are covered with a comically disproportionate number of personal injury lawyer ads. Louisiana’s trucking industry is pushing for a state moratorium on new highway billboards, in part because truckers are angry about trial attorney road signs that “demonize” truckers over injury claims. The proposals, Senate Bill 211 and House Concurrent Resolution 4, are mostly being touted as a way to make highways more scenic and trim driver distractions cited in thousands of accidents. The state has about 7,000 billboards, which backers of the bills say account for a hefty percentage of the total nationwide. Rep. Jack McFarland, R-Jonesboro and sponsor of the House measure, said voters are fed up. McFarland’s measure went full gangster on the trial attorneys, as it requires not only that billboards by more than 2,000 feet apart, which is double the current required distance, but also that advertisers on those billboards have to be located within three miles of the billboards they’re located on. That’s a direct shot at Gordon McKernan, the personal injury lawyer who has obnoxiously turned his family life into a 30-second reality TV show blasted out in commercial spots and has billboards virtually everywhere – from Shreveport to Grand Isle – in such volume that there is a spoof Facebook page with 12,000 followers which makes fun of all his billboards. “Obviously we are not going to attribute any motives to the sponsors,” Kilshaw said. Kilshaw also said billboards offer a path, cheaper than radio or TV, for firms to get their message out, and that company surveys show motorists are not bothered by the displays. “They appreciate the local advertising on the billboards,” Kilshaw said. Umm, no. Nobody appreciates all the trial lawyers advertising on all those billboards. Lamar does, of course, because they’re selling them all, but ask around the state and regular folks are as irritated as Appel and McFarland. Neither one of these bills will pass, of course, but they’re worth bringing anyway as an expression of distaste the public has for what is an unquestionable nuisance. We’re just happy the billboards are becoming a battleground in state politics. That’s long overdue.